See this picture? And the small blackish-red dot about 1/3 of the way on the right? That’s me. 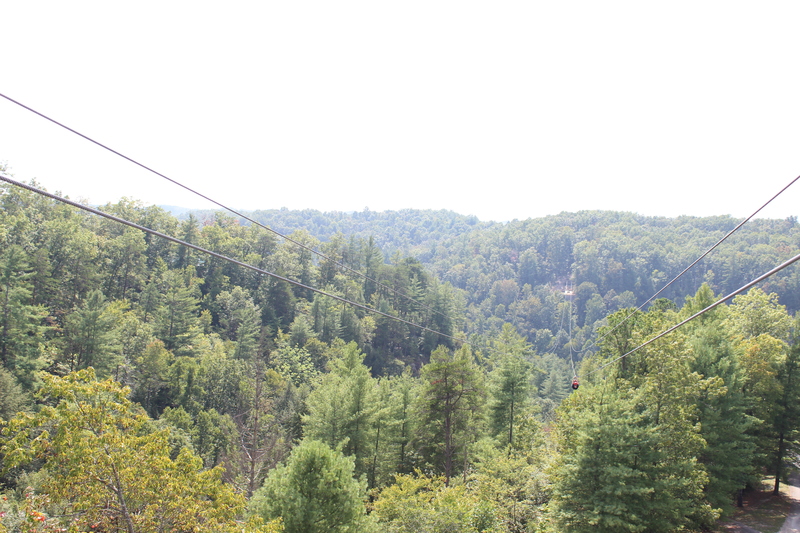 Ziplining about 300′ above the forest floor, and 1900′ from one end of the gorge to the other. It took more than a couple deep breaths, a few “you can do it!” mantras in my head, and one gigantic leap of faith to step off that platform. I don’t know about you, but the older I get, the more I find in my life I need to let go of. Having the courage to take that step over the forest treeline is a very real analogy for “letting go,” yet absolutely nothing like the courage needed to live real life. I suppose learning to “let go” might be a natural side effect of being a parent, but there’s more to it than that, I think. I mean, as a parent, after a point, you’re letting your children become responsible for certain aspects of their own life. And it starts pretty early, at least it did in our house. By age two or three, our kids were putting away their toys, helping set the table, cook, bring laundry to their rooms, etc… As they got older, they were in charge of more of their lives. As an example, being homeschoolers, I have always planned out each week’s worth of school work for them to do. I also break it down day by day, because for me, smaller goals seem more doable. When they were younger, I checked their work every day to make sure they had accomplished that day’s tasks. But as they got older, (and I only have one at home still) I let them figure it out. If they wanted to to finish 3 day’s worth of work in one really long day, so be it. If they have/had a lot of extra activities that week and they had to make up work on the weekend, well, that’s fine too. I have had to let go of my idea of a “perfect” plan, and slowly let them learn how to manage their own time and efforts. When we moved to where we currently live (and our house is for sale and we’ll be moving out of state again! ), I literally was in culture shock: we had moved from Central Florida to the mountains of rural Appalachia. In Florida there were palm trees, grocery stores on every corner, warm weather, and no lack of things to do, see, or places to go. Instead, we now had giant trees that lost their leaves, a single grocery store just under a half hour away, extremely cold, gray weather, and very little to do except hike. Neighbors weren’t next door; they were 1/2 mile down the road. To go, see, or do almost anything, it was, at the very least, a half-hour drive, but usually closer to an hour. Pioneer Woman may have come to love that in her life; it didn’t work so well for me! I had to learn to live with what we had. I didn’t always, and still don’t always do that well, but I’ve had to learn to let go of my ideal life. Maybe you’ve heard that saying “if Mama ain’t happy, ain’t nobody happy.” Well, it’s true. I could have spent the last 13 years crying and gnashing my teeth over where we live (and I have, at times!) but that’s not good for my family on a day to day basis. I have come to love certain things about where we are – letting my dogs roam on several acres, having a decent size garden outside my back door, and just a nice sense of privacy and quiet. But it took me a while to get here. Likewise, our oldest has graduated college, is living in a different state, and has made some choices that directly contradict the way we raised him. I would love to magically sweep in, and cast some kind of Harry Potter spell on his life so that things would be “right.” But that’s impossible, so I have to let go. Let God, really. I mean, despite all my admonitions to him throughout his life, all the prayers I’ve lifted on his behalf, I have to let him learn the lessons God wants to teach him. Not the lessons I want to teach him. I have to be willing to let God’s plan work out the way He wants it to; not the way I want it to. Now we cannot…discover our failure to keep God’s law except by trying our very hardest (and then failing). Unless we really try, whatever we say there will always be at the back of our minds the idea that if we try harder next time we shall succeed in being completely good. Thus, in one sense, the road back to God is a road of moral effort, of trying harder and harder. But in another sense it is not trying that is ever going to bring us home. All this trying leads up to the vital moment at which you turn to God and say, “You must do this. I can’t. And I guess that’s really the wonderful thing about getting older…. learning that so much of life really isn’t within our control. Learning that there is a plan greater than ourselves out there. Learning that if we just surrender, more often than not, life will actually be better than what we hoped for. Better than what we, in our limited understanding and experience, could ever envision.